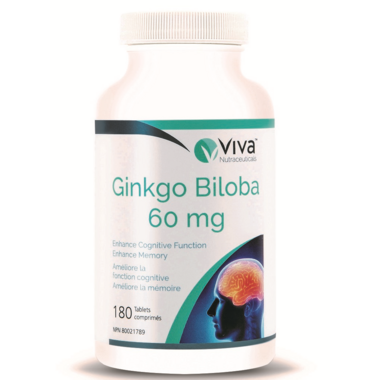 Ginkgo Biloba is known for improving blood flow to the brain and help preventing memory problems. It helps to enhance cognitive function in adults, and supports peripheral circulation. Recommended Dose: Adults: Adults: Take 1 tablet once a day orally 2 times a day with a glass of water. For prolonged duration of use, consult a health care practitioner for use beyond 6 weeks. Caution: Keep out of reach of children. Consult a health care practitioner prior to use if you are taking medications for diabetes, high blood pressure, or seizures. If you are pregnant or breastfeeding, consult a health care practitioner prior to use. Do not use if you are taking health products that affect blood coagulation (blood thinners, clotting factor replacements, acetylsalicylic acid, ibuprofen, fish oils, vitamin E) as this may increase the risk of spontaneous bleeding.Consult a health care practitioner if you have diabetes, infertility, bleeding disorders, surgery or history of seizure prior to use.Ginkgo might cause an allergic reaction in people who are allergic to poison ivy, poison oak, poison sumac, mango rind, or cashew shell oil.